Already during his lifetime, Henri Grialou was radiating the love of God. He was close to people and lived fully with God. Through his actions, his words, his friendliness he was seeking the good and the truth. He carried out his tasks, made concrete choices with the help of Holy Spirit, and let himself be guided by God’s light. Given his reputation of sanctity, his Cause of Beatification and of Canonization was opened in 1985 by Abp. Raymond Bouchex, Archbishop of Avignon who formed an ecclesiastical tribunal and a commission of experts. He has given everything to me, the Good Lord has. The depths of God is Love. 25,000 pages of documents and of testimonies were sent in 1994 to Rome, to the Congregation for the Cause of Saints. 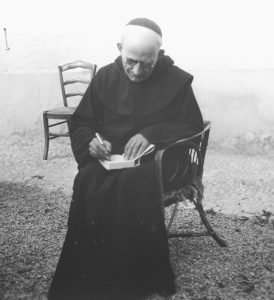 The latter then undertook to write a Positio presenting a well-documented biography and all the elements needed to judge the heroic virtues (theological and cardinal virtues, and annexes), i.e., of the sanctity of Fr. Marie-Eugène. This Positio on the heroic virtues was finished in 2000. In fact two inquiries are needed for the Church to recognize someone to be Blessed. One on the life of the Servant of God, and the other on a possible miracle. In front of the positive result of these two inquiries and the relevance of the message nurtured and transmitted by Venerable Marie-Eugène of the Child Jesus, Pope Francis authorized his beatification. This decision was officially communicated on 4 March 2016. In celebrating his beatification on November 19, 2016, the Church offers to a greater number of people the possibility of getting to know him and to benefit from his witness. I am made to lead souls to God, to lead them to divine union. It encourages us to confide our intentions to his prayer. The Blessed thus carries on his mission, coming to the encounter with those seeking meaning in life, those who are seeking God. Making him known more widely in his double dimension as Father and Spiritual Master contributes also in helping him to accomplish his mission in the Church. And who knows ? Maybe he will be canonized one day ?